Henry Hudson (1565?-1611?) 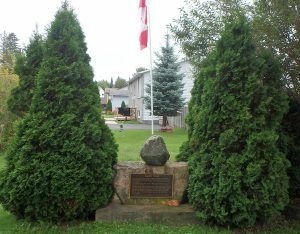 – An English sea explorer and navigator during the early 17th century, Hudson is best known for his explorations of present-day Canada and parts of the northeastern United States. Hudson’s date of birth and the details of his early life are undocumented. 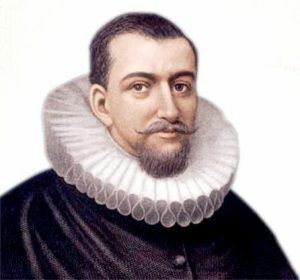 Some sources have identified Henry Hudson as having been born in about 1565, but others date his birth to around 1570. Hudson is thought to have spent many years at sea, beginning as a cabin boy and gradually working his way up to ship’s captain. Hudson was a headstrong but courageous commander. Though he often mismanaged his crews by playing favorites or letting morale suffer, he was a competent navigator. Records indicate that he was married and had three sons. In 1607 and 1608, Hudson made two attempts on behalf of English merchants to find a rumored Northeast Passage to Cathay (present-day China) via a route above the Arctic Circle. In 1609 he landed in North America and explored the region around the modern New York metropolitan area, looking for a Northwest Passage to Asia on behalf of the Dutch East India Company. It was on this voyage on his ship, the Half Moon, that Hudson, by chance, sailed up the Hudson River, which was later named for him. Strong headwinds and storms forced them to abandon the northeast voyage they had been assigned. 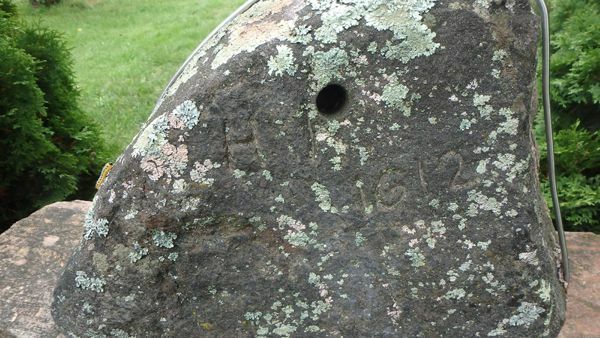 After 150 miles, the Half Moon did not reach the Pacific, but it did reach what would later become Albany, New York. Rather than return to Holland with nothing to report, the crew voted to look for the Northwest Passage, a legendary waterway that would carry a ship all the way from the Atlantic to the Pacific Ocean. They passed by the island we know today as Manhattan and thereby laid the foundation for Dutch colonization of the region. In 1610, Hudson returned to America, this time in the service of the English. In early August, he entered the vast body of water now known as Hudson Bay. On November 1, 1610, the Discovery sailed close to shore James Bay, off the coast of Northern Quebec, but by November 10th they were frozen in. The winter was difficult. With supplies running low, Hudson began to ration the food which, over time, created resentment and division of the crew. Many were sick suffering from scurvy. On June 22, 1611, Hudson wanted to press on to the west. However, most of the crew of the ship wanted to get back to England and mutinied. The mutineers seized Hudson, his son, and seven other members of the crew and set them adrift in a small boat. The Hudsons and their companions were never seen again. The Discovery made it back to England, where the crew went on trial for Hudson’s murder later that year. According to court documents, the remaining crew admitted to cutting the captain and his loyal crew loose. In the end, no one was charged. The Hudson River, once known to the Mohican Indians as Muhheakunnuk which meant “Great Waters Constantly in Motion”, was the site of key battles in the American Revolution. Today, the Hudson is one of the nation’s most important waterways. Oceangoing ships can navigate the river to Albany year-round. Pleasure boats and tugboat and barge traffic can reach the Great Lakes from May to November. Cargo such as wood pulp, steel, cocoa beans, grain, and scrap metal rely on the Hudson for deliveries. The U.S. Military Academy at West Point overlooks the Hudson River. 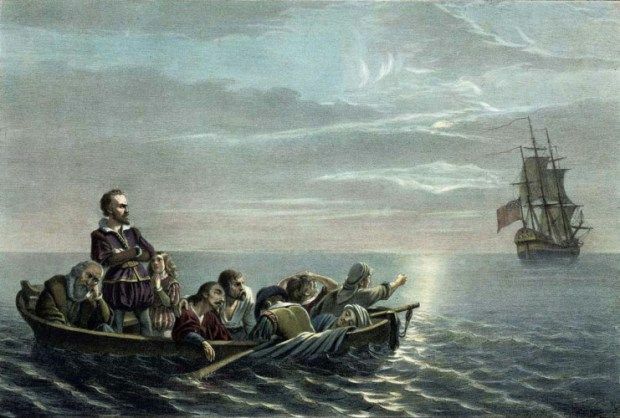 Did Henry Hudson Survive the Mutiny? According to some theories, yes, he did. Could Hudson and his crew and have made the journey? Hudson was an experienced and determined sailor and navigator and would have had no trouble getting the lifeboat to shore. One local legend states that Hudson, his son, and the 7 crew members loyal to him made it to shore and joined a group of area natives where they lived out the rest of their lives. Another version of the tale states that the men were kidnapped by the Indians and eventually killed. To date, no forensic studies have been done to verify the artifact. Today the stone sits in Tenna-Brise Park in the village of Chalk River, Ontario. © Kathy Weiser-Alexander, April 2018.